Here and on the next page I have listed the main operations in which the Royal Naval Beach Commandos were involved and started a set of brief descriptions with photographs, maps and links to web pages and documents specific to those operations to give some insight of what each operation involved. Please note that the Royal Naval Beach Commandos were one of many units deployed by Combined Operations for amphibious operations many of whom had equally dangerous duties, however it was still the combat units primarily the infantry be they American, British, Commonwealth or other allies that did most of the fighting and dying. For the purposes of this website I have concentrated only on the beach operations and for larger operations just the beaches where Royal Naval Beach Commandos were present. This is a self-imposed limitation and not meant to detract from the actions on other beaches or those operations beyond the beaches. I have divided the operations into four sections, RN Beach Party Operations in 1942, North West Europe 1944-45, and South East Asia Command 1944-45 on this webpage and Italy and the Mediterranean 1943-45 on the next web page. The various Beach Parties used on Operation Ironclad had been associated with individual transports and were known as “Keren” party, “Karanga” party etc; afterwards they were grouped together as Royal Naval Beach Party Able. On the 14th March, "Force 121" was constituted under the command of Major-General Robert Sturges of the Royal Marines with Rear-Admiral Edward Syfret being placed in command of Naval Force H and the supporting sea force. The expeditionary force for Operation Ironclad consisted of three infantry brigade groups and No.5 Army Commando. The Allies' main landings were around Baie du Courrier and Baie du Ambararata across a narrow peninsula from Diego Suarez, the main naval base on the northern tip of Madagascar. The landings started at 4:30 am on the 5th of May 1942. A quarter of an hour later the Fleet Air Arm attacked the harbour of Diego Suarez and Arrachart airfield just south of Antsirane. They also dropped dummy paratroopers as part of a deception plan, similar to those dropped at the beginning of Operation Overlord in Normandy. The landings were initially successful No.5 Army Commando plus a company of the East Lancashire Regiment landed in Baie du Courrier, captured their initial objectives, a coastal battery and the enemy position ‘Windsor Castle’. They then advanced onto capture the harbour of Diego Suarez. Further South at the 29th Independent Infantry Brigade landed in the Baie du Ambararata, here all the forces land artillery and tanks were landed, initial resistance was light but later they came up against the Joffre Line the enemies main defensive positions, which caused the expeditionary force to falter. As a result Royal Marines from the ship’s company of HMS Ramillies were despatched on the destroyer Anthony through the Oronjia Pass into the Bay of Diego Suarez to make a diversionary attack on Antsirane. This they did seizing the headquarters of the Artillery Commandant. With the aid of the diversion the British Expeditionary force now reinforced forced their way through the Joffre Line. This led to the surrender of the town of Antsirane and naval base. This is all the British had aimed to achieve from the operation. However after an attack on HMS Ramillies inside the port of Diego Suarez by a two man Japanese midget submarine and further attacks in the Indian Ocean on ships taking supplies to the Eighth Army it was decided to complete their conquest of Madagascar. This second phase started on the 10th of September with an amphibious assault, Operation Line, on the harbour of Majunga by the 29th Independent Infantry Brigade, No.5 Commando and the men of the Naval Beach Party Able. The Madagascar campaign eventually ended with the surrender of the Vichy French on the 5th of November 1942. Colin Smith covers the Madagascar campaign in great detail in his book ‘England’s Last War Against France’. The original Royal Naval Beach Party Charlie and Dog took part in Operation Jubilee. RN Beach Party Charlie lost a considerable number of officers and men and sub unit C2 was lost in total. The majority of RN Beach Party Dog were casualties and it was decided not to reform the unit in the UK. The RN Beach Commando units deployed on Operation Torch were C, E, F and G Commandos, the original H commando and a hastily formed J1 party. C and E RN Beach Commandos plus the J1 party were allocated to the landing in Oran in the Central sector. F Commando and G were allocated to the Eastern Sector. G landing on the Apples Beaches. Les Seldon of RNBSS B5 recalled they landed with J Party and took part in the capture of Aeronautic Arzeu, the French Fleet Air Arm base near Oran. The two sub-units G2 and G3 of George RN Beach Commandos were then deployed on the subsidiary landing Operation Perpetual at Bougie. Despite information that British troops might get an unfriendly reception at Bougie, at 06:15 on the morning of November 11th, troops of the 6th Battalion, Royal West Kent Regiment, came ashore at Bougie unopposed. However the calm was not to last long and a German and Italian airborne storm soon arrived. A description follows of Operation Perpetual by Lt Cdr M. V. Redshaw, VRD*, RNVR the Beach Master of the sub unit G2 of George RN Beach Commando. We embarked in the Awatea (LSI) in company with the 5th Buffs for the next landing, which was at Bougie. The Bougie landing was no trouble but this time the Luftwaffe and the Italian Air Force were organised and for the best part of a week we had one big air raid broken only by short intervals. During this week we helped discharge the follow-up store ships in the bay. We had no air cover during this period. Our own air force being grounded at Djidelli airfield awaiting the arrival of the petrol and ammunition we were trying to get out of the ships in Bougie Harbour. Many ships were lost during this week due to lack of air cover, including the Karanja, Cathay (LSIs) and Tynwald (AA cruiser). Bougie was full of survivors from the ships but I am glad to say that, although Awatea was sunk soon after we left her with most of our stores, my Petty Officer reported later that we had suffered no casualties, and no loss of arms and ammunition, and that we were ready for action. While Karanja was on fire before sinking, some of my men commandeered a landing craft, went alongside Karanja and collected stores. Bougie was indeed a nightmare and we were more than pleased when we sailed from there in LCMs carrying petrol for the aircraft grounded at Djidelli. Around the 19th of November, the two sub sections of George RNBC moved off to Bone in LCA and LCM with the flotillas. Making the trip in three night passages to Djidjelli, Philippeville and finally Bone. They were inland at Souk Ahras in late November and were as far as Tabarka in Tunisia in early December but then returned to Bone in Algeria. The Beach Commandos State Report for December 14th 1942 shows both G2 and G3 sub sections still on Operation Torch but the following week’s report on the 20th of December 1942 shows both sub sections back at Foliot III. However the State Reports also show Lt Redshaw and Lt Turton remained in theatre. During which time Lt Redshaw reported they served with numbers 1 and 6 Army Commandos for a short period spending Christmas day in the Hotel Transatlantique in Bone and returning to England, going alongside in Liverpool on the 13th of January 1943. The landings in North Africa are the focus of 'Invasion North Africa 1942' by S.W.C Pack. As part of Force 'S', Fox and Roger RN Beach Commandos assisted the landing of the British 3rd Infantry Division on Sword Beach on D-Day. As part of Force 'J', Love, Peter and Sugar RN Beach Commandos assisted the landing of the 3rd Canadian Division on Juno Beach on D-Day. As part of Force 'G', Jig, Queen and Tare RN Beach Commandos assisted the landing of the British 50th Infantry Division on Gold Beach on D-Day. In Operation Infatuate, the final battle for Walcheren, Royal Navy Beach Commando L and elements of J commando supported 4 Commando Brigade and the 52nd Lowland Division. The operation had two distinct halves, 'Infatuate I' which was the attack on Flushing by No.4 Army Commando followed up by the 52nd Lowland Division with L3 section of RNBC L and elements of RNBC J and 'Infatuate II' which was the attack on Westkapelle by the remaining three Royal Marine Commandos 41, 47 and 48 of 4 Commando Brigade with L1 and L2 of RNBC L manning the beachhead. The attack on Weskapelle is also notable for the valiant self-sacrifice of the Support Squadron Eastern Flank, who engaged the German coastal guns in a one-sided duel drawing fire away from the landing craft carrying the commandos and amphibious assault vehicles. The 'Battle for Antwerp – The Liberation of the City and the Opening of the Scheldt' by Major General J.L. Moulton RM, who was CO of 48 Commando RM during the assault, covers the battle in detail as well as putting it into context. Both Jig and Mike RN Beach Commandos were involved with operations in NW Europe in 1945 including the crossing of the Rhine, Operation Plunder. During this time Mike RNBC was part of 'T Force'. 'Force P’ was formed in India with the three RN Beach Commandos A, H and O, in the autumn of 1943. 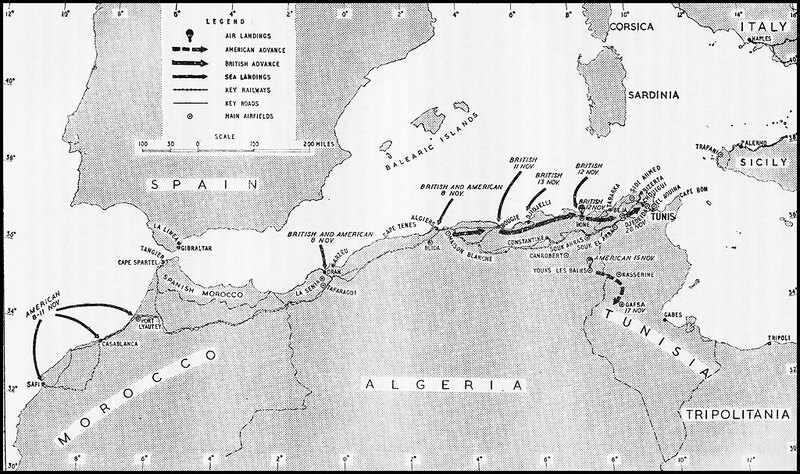 It was intended Force 'P' would land the whole of the British 2nd Division behind the Japanese on on the Mayu Peninsular but the operation was cancelled because over 18 LST that had been en route to India were diverted to ferry reinforcements to the Salerno Landing, Operation Avalanche. Later a similar operation, Operation Pigstick was cancelled because the LST’s then in India were recalled to participate in the Anzio Landings in January 1944. A and O RN Beach Commandos also went back to the Mediterranean but H RN Beach Commando stayed on. They would to take part in the Second Arakan Campaign. The Second Arakan Campaign started in December 1943 but by January 1944 Chittagong was proving less and less satisfactory as a base for operations. 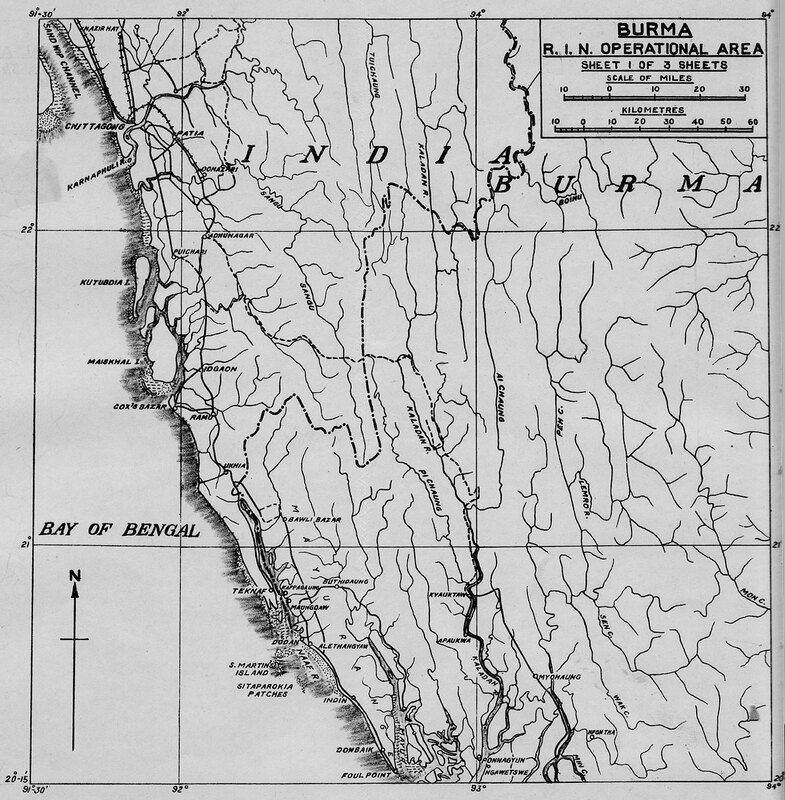 The XV Indian Corps, with headquarters some 8 miles north-east of Maungdaw, was anxious for closer support from the naval force, hence it was proposed that a proper advance base be set up for the boats at Teknaaf, which would be known as advanced base "Millie". H RN Beach Commando was tasked with the initial defence of advanced base "Millie". Prior to that acting Commander Cobham GC RN, the commanding officer of RNBC H was provided with an amphibious jeep and visited the Naaf River and associated Army locations with two army colonels from Mountbatten’s staff, enabling him to see something of the area in which they were to operate. Advanced base “Millie” was to be a tented camp for the crews of minor landing craft and other small vessels and their maintenance units. It was located on the west bank of the Naaf River in a quarter mile wide stretch of flat ground between the river and a two thousand foot mountain range and was covered in medium thick jungle. To the south of the base were some army and anti-aircraft positions. Further south was the village of Teknaaf. Later on H RN Beach Commando took part in raiding operations including Operation Screwdriver in March 1944 in which they assisted 3 Commando Brigade for that operation comprising of No.5 Army Commando and 44 Commando Royal Marines. After the campaign had finished the Distinguished Service Medal was awarded to Able Seaman Charles Frederick Malyon, C/JX.167181 (St. Albans) of H RN Commando for gallantry in carrying a wounded man to safety under shell and machine gun fire during operations in the Arakan. Four RN Beach Commando units were in South East Asia at the end of the War, they were Charlie, Easy, Uncle and Victor. Victor RN Beach Commando and 'A' Beach Commando of the Royal Indian Navy took part in operations in Burma during this period. All the units were then employed later in Malaysia. Elements of Victor RN Beach Commando may of taken part in the Battle of Ramree Island south of Akyab. The battle was carried out by the Indian 26th Infantry Division and started on the 21st January 1945 with Operation Matador, an amphibious assault to capture the strategic port of Kyaukpyu located at the northern tip of Ramree Island, south of Akyab across Hunter's Bay and the key airfield near the port. On the 1st of May 1945 during Operation Dracular, at least elements of Victor RNBC were landed at Elephant Point. Possibly to aid the force landed to relieve the Gurkha airborne battalion dropped in to seize the point. The Allies then having realized the Japanese had virtually left Rangoon decided to go straight in the next day. Minesweepers cleared a passage up the river from Elephant Point and landing craft then went ashore in the early hours of the 2nd of May 1945, almost the last day on which beach landings would of been possible before the heavy swell caused by the monsoon became too bad. This allowed troops of the Indian 26th Infantry Division to occupying the city without opposition that day. The Japanese in Malaya signed their surrender document on the 2nd of September 1945. The British then landed in Malaya on the 9th of September in the Port Swettenham area, as part of Operation Zipper. Able Seaman Alf Humberstone of 'U' RN Beach Commando recollects the landing in the book Beachhead Assault by David Lee, so at least part of 'U' RN Beach Commando was there possibly as part of the 46th Indian Beach Group.